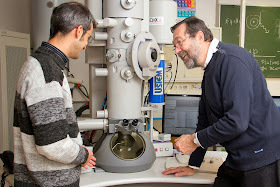 Transmission electron microscope that was used in the experiment. Foreground: Michael Stöger-Pollach (left) and Peter Schattschneider. 6Department of Physics, University of Michigan, Ann Arbor, USA. Inspired by theoretical calculations [1,2] from RIKEN (Japan), the group at Vienna University of Technology devised a way to generate free-electron Landau states , a form of quantized states that electrons adopt when moving through a magnetic field. Landau levels and states of electrons in a magnetic field are fundamental quantum entities underlying the quantum Hall and related effects in condensed matter physics . Landau states can be envisaged as electron vortices occurring naturally in the presence of magnetic fields. The magnetic field plays the same role for electrons as the earth's rotation plays for the creation of cyclones, but here on a nanometer scale, where quantum effects become important . January 17, 2009: "Optical Magnus Effect: Topological Monopole Deflects Spinning Light". Classical electrons in a uniform magnetic field propagate freely along the field and form confined circular orbits in the plane perpendicular to the field. The angular velocity of such orbiting is constant and is known as the cyclotron frequency. But quantum mechanics calls for a counter-intuitive behaviour . The researchers were able to induce intrinsic rotation in single moving electrons. It was observed  that Landau modes with different azimuthal quantum numbers belong to three classes, which are characterized by rotations with zero, Larmor and cyclotron frequencies, respectively. This is in sharp contrast to the uniform cyclotron rotation of classical electrons, and in perfect agreement with recent theoretical predictions . States with different quantum numbers are produced using nanometre-sized electron vortex beams, with a radius chosen to match the waist of the Landau states, in a quasi-uniform magnetic field. Scanning the beams along the propagation direction , the researchers reconstructed the rotational dynamics of the Landau wave functions with angular frequency of the order of 100 GHz. Figure 1: A holographic fork mask generates a row of vortex beams with different azimuthal indices m. These beams are focused by a magnetic lens and are studied in the region of maximal quasi-uniform magnetic field (red arrow on the left). The focal plane is shifted a few Rayleigh ranges below the observation plane z=0 to reduce the Gouy-phase rotation. A knife-edge stop is placed at zk, where it blocks half of each of the beams. 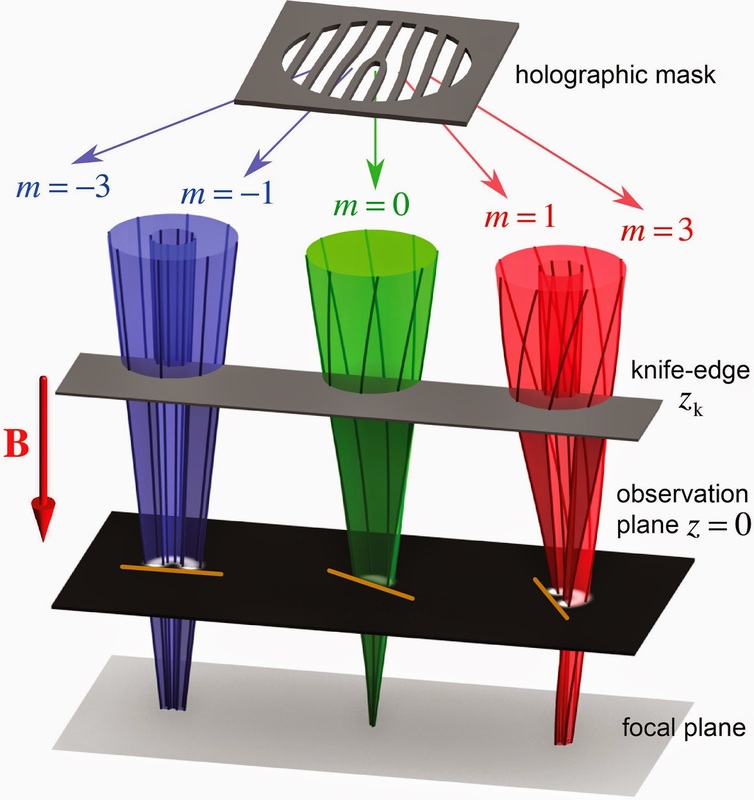 Varying the position zk of the knife edge allows the observation of the spatial rotational dynamics of the cut beams propagating to the observation plane . The focusing lenses of a transmission electron microscope were used  to reconfigure the vortices so that they almost perfectly resembled Landau states. In an electron vortex beam, the wave current swirls around a common center similar to air in a tornado . Measuring the rotation can be compared to determining how many times a thin wire is wound around a rod. When looking at the wire directly, it is extremely difficult to count the number of windings. But when stretching it along the direction of the rod, the wire takes the form of a well-spaced spiral, for which it is easy to count the revolutions. This is precisely what happens with Landau states: they were 'elongated' to vortex beams. That way, their rotation could be measured  with very high accuracy. This is a very exciting finding that will contribute to a better understanding of the fundamental quantum features of electrons in magnetic fields . In addition to showing that the rotational dynamics of the electrons are more complex and intriguing than was once believed, the new findings could have practical implications for technology. Taking Landau states into free space, away from the solids where they normally play a key role [4,7], can inspire new ideas in materials science. This will certainly lead to novel insights and a better understanding of the delicate interaction between magnetic fields and matter, which might one day give rise to new and better technologies such as sensors, memory devices, or nanomanipulation. Konstantin Yu. Bliokh, Yury P. Bliokh, Sergey Savel’ev, Franco Nori, "Semiclassical dynamics of electron wave packet states with phase vortices". Physical Review Letters, 99, 190404 (2007). Abstract. Konstantin Y. Bliokh, Peter Schattschneider, Jo Verbeeck, Franco Nori, "Electron vortex beams in a magnetic field: a new twist on Landau levels and Aharonov-Bohm states". Physical Review X, 2, 041011 (2012). Abstract. P. Schattschneider, Th. Schachinger, M. Stöger-Pollach, S. Löffler, A. Steiger-Thirsfeld, K. Y. Bliokh, Franco Nori, "Imaging the dynamics of free-electron Landau states". Nature Communications, 5, 4586 (2014). Full Article. Daijiro Yoshioka, "The Quantum Hall Effect" (Springer, 2002). J. Verbeeck, H. Tian, P. Schattschneider, "Production and Application of Electron Vortex Beams". Nature, 467, 301 (2010). Abstract. Giulio Guzzinati, Peter Schattschneider, Konstantin Y. Bliokh, Franco Nori, Jo Verbeeck, "Observation of the Larmor and Gouy rotations with electron vortex beams". Physical Review Letters, 110, 093601 (2013). Abstract. David L. Miller, Kevin D. Kubista, Gregory M. Rutter, Ming Ruan, Walt A. de Heer, Markus Kindermann, Phillip N. First, Joseph A. Stroscio, "Real-space mapping of magnetically quantized graphene states". Nature Physics, 6, 811–817 (2010). Abstract.